Now the challenge: can you succinctly define your own leadership philosophy? Can you stand before those you lead and explain, with conviction, your leadership philosophy without using notes? I have often challenged leaders to do just that, but not before they had done the thoughtful work to clarify their thinking about leadership. On one occasion, the leader talked for 30 minutes with passion and conviction about his new leadership philosophy. Months later his team, having changed their minds about his effectiveness, voted him the “Leader of the Year Award” during his farewell dinner, as he moved on to take a promotion. What caused them within a matter of a few months to go from clamoring for his removal to voluntarily awarding him for his new approach to leading? The answer: he came to realize that his former leadership philosophy was not working. By changing his leadership philosophy and then implementing it, he experienced the joy of being embraced for his leadership effectiveness. And team performance metrics clearly improved. First, it teaches that all behavior, including leadership behavior, proceeds from the inside out. “It is from the heart that the mouth speaks” VERSE And a corollary truth follows: internal beliefs affect external behavior. What I believe or assume, even implicitly, about the work of leading, will be evidenced outwardly in my behavior. Said another way, what is going on on the inside, shows up on the outside. And on the inside, the bible reveals that there are two things “going on.” Our conceptual understanding of what leaders are supposed to do and the condition of the heart. A “fleshly” heart will produce “fleshly behavior”; a Spirit-led heart will bear the fruit of the Spirit in my leadership initiatives. Likewise, on the outside, two factors are evident. 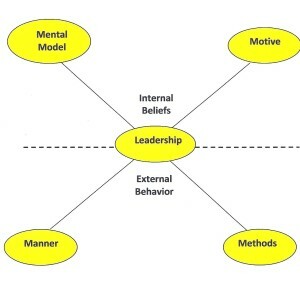 The manner in which one interacts with others and the various methods or processes one uses to tackle the work of leading. Generally speaking these two factors are often referred to as Task and Relationship. 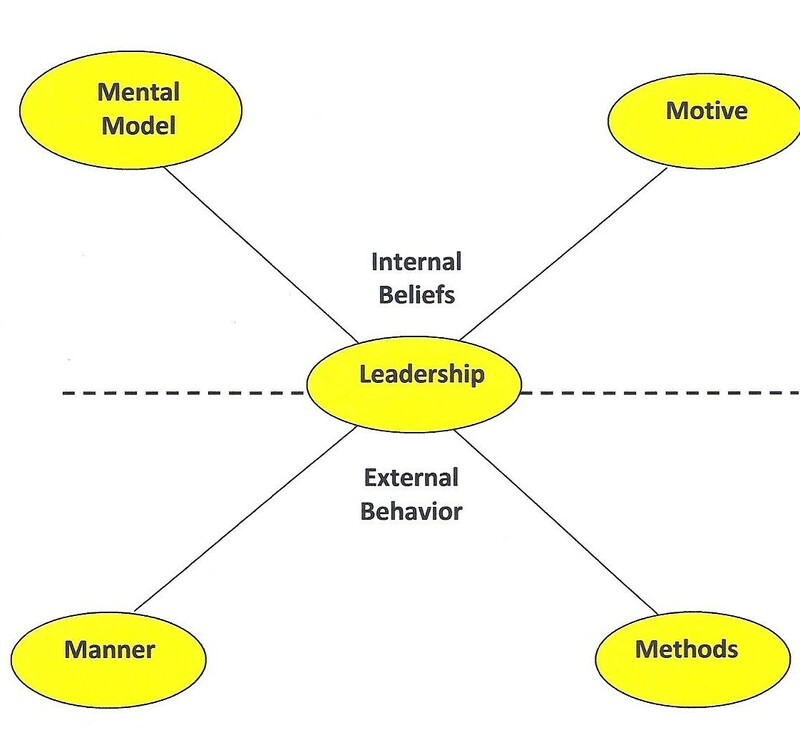 The diagram below illustrates what can be called a Leadership Philosophy Map. Back to the Original Question – What is your leadership philosophy? Answer the four questions below to develop the first draft of you leadership philosophy. How do I conceive of the role of a leader? Fill in the blank…. I conceive of a leader as a _________ (servant, rancher, shepherd, coach, facilitator, equipper, visionary, etc. Taking all your personal methods, systems or routines into consideration, how would you describe them? My methods are_______________ (well planned, spontaneous, structured, flexible, goal-based, controlling, hands-off, practical, haphazard, last minute, etc. A Word of Caution – it is clearly obvious that we can answer these questions based on the way we want to be perceived or the way we actually act. Or we can view them as the way we used to lead or how we currently lead now that we’ve grown in Christ. Don’t fool yourself. Be seriously honest. You might even ask others how they perceive you? A good approach is to answer these questions twice – how you used to be, and how you are today. Or how you are currently and how you desire to be tomorrow, with God’s grace. 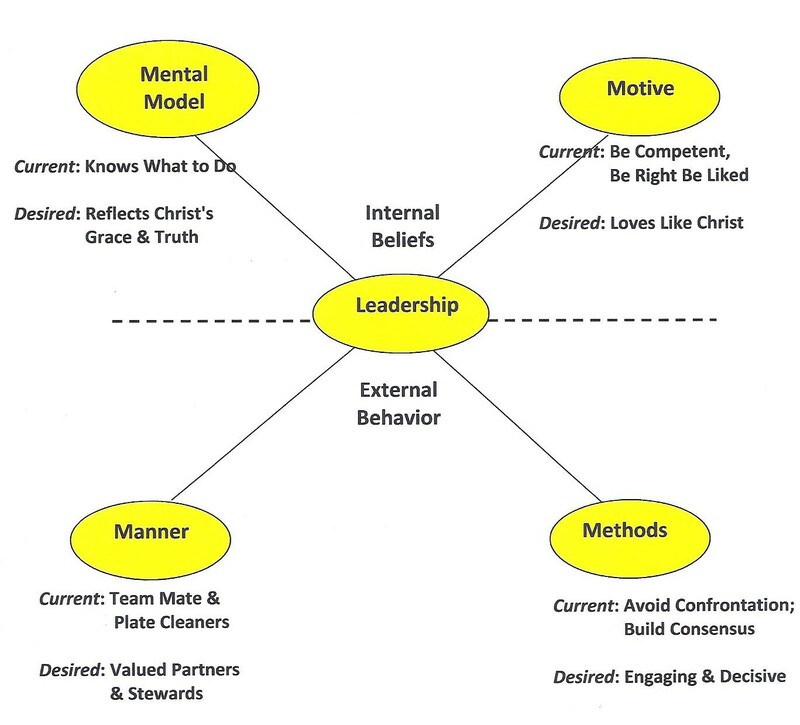 Here is how one pastor answered these questions and his resultant Leadership Philosophy Map. 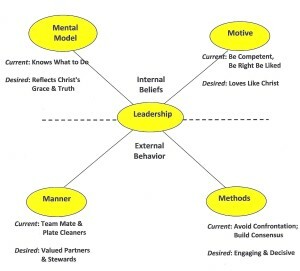 More explanation of the biblical basis for this leadership philosophy map is available in The Servant’s Guide to Leadership, Beyond First Principles, by Richard Rardin, available on this website or through Amazon.com.